Easily set up and manage your JBL Link 10 using the free Google Home app. Wirelessly stream high-quality sound from your smartphone or tablet on Wi-Fi or Bluetooth®. Stream and control your music hands-free with the help of Google Assistant. 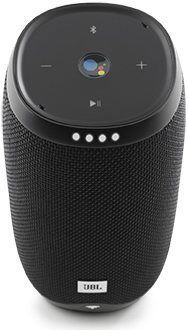 The JBL Link 10 has Google Assistant built-in. Go ahead and ask it questions or tell it to do things because it’s always ready to help. Instantly stream your favourite music, radio or podcasts from your mobile device to your speaker. Chromecast streams directly from the cloud so you can enjoy crystal clear sound, exactly the way the artist intended. With an IPX7 Waterproof rating, there’s no need to worry about rain or spills. You can even submerge Link 10 in up to 3ft (1m) of water. Made from durable fabric material and rugged rubber housing, the JBL Link 10 is prepared to outlast all your adventures. Enjoy multi-room listening when you join your Link 10 speaker with other Chromecast-based audio devices. JBL Link 10 works with most Apple or Android devices. Set up and manage JBL Link 10 with the Google Home app. Use Wi-Fi to activate Google Assistant and either Bluetooth® or Wi-Fi to stream.